This chapter sheds light on counterpublics that were created despite the authoritarian politics and elaborated censorship system put in place in Tunisia. I do not claim to give an exhaustive account of the multiple attempts to create (feminist) counterpublics under the authoritarian regimes throughout Tunisia’s history.63 Rather, my analysis centers on three distinct counterpublics. 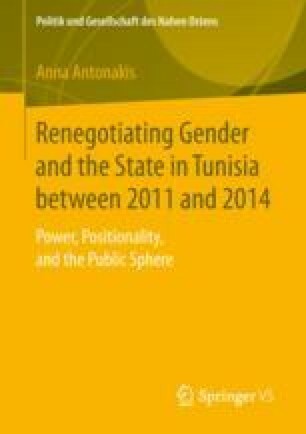 They present different dimensions for preparing the ground for the uprisings of 2010/2011 and the renegotiation of gender in the public sphere once the authoritarian state started to lose its grip on power.